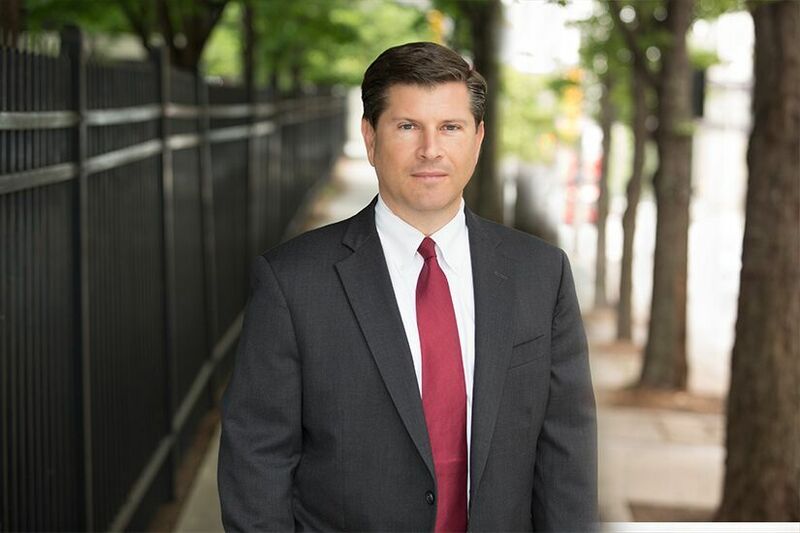 Terrell W. “Chip” Benton, III, is a Partner in the Atlanta office of Hall Booth Smith, and he specializes in general liability, professional malpractice and ethics, professional negligence and medical malpractice. His primary focus is representing physicians, hospitals and other healthcare workers in medical malpractice lawsuits, and he has represented physicians before the State Composite Medical Board and the State Dental Board. He also has extensive experience in handling premises liability, toxic torts, malicious prosecution, trucking and automobile liability cases, and has tried many cases throughout the state in these matters. Chip began his legal career as a law clerk to Honorable Kenneth Kilpatrick in the Superior Court of Clayton County, where he was responsible for drafting orders on all motions before the Court. He joined Hall Booth Smith in 2000, and became a partner in 2004. Chip is very active in the community, and volunteers with the Truancy Intervention Project where he represents children in juvenile court on truancy matters. He serves on the Advisory Board for the Metro Atlanta Salvation Army, and has served as a volunteer for Habitat for Humanity. He has been active in Peachtree Road United Methodist Church, and coaching in various youth sports programs in Atlanta. He is married to Mary T. Benton and they have two sons, Will and Marshall. “Update of Georgia Law on General Liability,” Atlanta Claims Convention, 2003. “Hospital Liability for Doctors Practicing as Independent Contractors,” For the Record, Hall Booth Smith, 2002. “Recent Developments in Medical Malpractice,” Hall Booth Smith Healthcare Law Seminar, 2002. “Court of Appeals Adopt, Continuing Treatment Doctrine in Appropriate Medical Malpractice Case Including Alleged Misdiagnosis,” For the Record, Hall Booth Smith, 2001. “Situational Ethics: Ethics and Professionalism at Alternative Dispute Resolution and Trial,” The Atlanta Claims Association. “How to Avoid Malpractice Lawsuits,” The Medical Protective Company CME for Dentists and Physicians, Atlanta, 2003 & 2004. Medical Malpractice Seminar: Update on Case Law, 2009. “Update on Medical Malpractice Law: Recent Cases and Their Impact on the Defense,” Annual North Georgia Seminar, November 2004. Mr. Benton has extensive experience in general liability cases, including premises liability, automobile liability and construction cases. Chip Benton has been litigating in the health care field since 1997. He represents doctors, nurses, and hospitals throughout the State of Georgia. He handles all matters in medical negligence cases and other high exposure catastrophic injury cases. He has extensive first chair jury trial experience in all areas of Georgia with over forty jury trials. In addition, Mr. Benton has represented physicians before the State Composite Medical Board, the State Dental Board, and other regulatory agencies. Lead counsel in a medical malpractice case defending a rheumatologist. The allegations involved over-prescribing Imuran and failing to monitor blood levels. Received defense verdict in the U.S. District Court for the Northern District of Georgia. Lead counsel for neurosurgeon in Cobb County, Georgia for a case involving failure to treat recurrent pituitary tumor. Received defense verdict, 2008. Lead counsel for emergency medicine physician in Middle Georgia accused of failing to diagnose Stevens Johnsons Syndrome. Received defense verdict, 2008. Lead counsel in medical malpractice case for pain management physician. The allegations involved physician’s improper technique for performing cervical epidural steroid injections. Received defense verdict, 2007. Lead counsel in medical malpractice case in Gwinnett County involving nursing home care. Received defense verdict for internist for his alleged failure to monitor patient’s PT/INR and Coumadin levels, 2007. Lead counsel for orthopedic surgeon in Baldwin County, Georgia, where allegations included physician’s improper removal of locking plates for radius and ulna surgery. Received defense verdict, 2007. Co-lead counsel for CRNA in Fulton County. CRNA allegedly moved a patient pre-surgery allegedly causing his paralysis. Received defense verdict, 2007. Lead counsel for cardiothoracic surgeon in Fulton County, where allegations include failure to diagnose a deep vein thrombosis post quadruple bypass surgery. Received defense verdict, 2007. Lead counsel for emergency room physician in wrongful death case where the physician allegedly failed to diagnose a volvulus. Received defense verdict, 2006. Lead counsel for family practice physician in wrongful death action for failing to diagnose Cryptococcus for a patient previously diagnosed with Sarcoidosis. Received defense verdict, 2010. Lead counsel for dentist accused of improperly severing the lingual nerve during an extraction. Received defense verdict, 2009. Lead counsel for general surgeon in placement of dialysis catheter. The allegations involved improper surgical technique and failing to recognize complication. Received defense verdict, 2013. Lead counsel for dermatologist in Henry County, Georgia. The allegation was improper removal of a cyst on the scalp. Received defense verdict, 2013. Lead counsel for urologist in Toombs County, Georgia. The allegations were that urologist improperly administered microwave therapy for prostate reduction. Received defense verdict, 2013. Lead counsel for OB/GYN in Fulton County. The allegations involved retained sutures after a hysterectomy. Received defense verdict, 2013. Lead counsel for vascular surgeon in Fulton County on claims for negligence while placing a catheter. Received defense verdict, 2014. Lead counsel for pain management physician in Coweta County including allegations of improper placement of an epidural. Received defense verdict, 2014. Lead counsel for pain management physician in failure response to complications post epidural in Athens-Clarke County. Received defense verdict, 2015. Lead counsel for local hospital for patient fall in hospital room in Fulton County. Received defendant’s verdict, 2018. Mr. Benton’s practice includes representation of attorneys in legal malpractice claims ranging from real estate issues to fraud to general legal matters.